Vancouver, BC, 24 July, 2017 — Mirasol Resources Ltd. (TSX-V: MRZ, OTCPK: MRZLF “Mirasol”) is pleased to announce that it has defined three large-scale porphyry Cu-Mo-Au targets, and also expanded its claim holdings, at its 100% owned Rubi Project (“Rubi”) situated adjacent to the giant El Salvador copper mining district in northern Chile. Rubi (Figure 1) lies at relatively low elevation within 20 km of El Salvador and Portrerillos porphyry Cu-Mo-Au mines, with highly favourable infrastructure advantages such as year-round access, adjacent townships with a trained mining workforce, nearby roads, power, water grid and an operating mill and smelter. Rubi has a prospective geological setting centered on structural intersections with the Domeyko Fault System, a through-going regional-scale structure and the Ojos del Salado trans-orogen structure, interpreted to have influenced the emplacement of the near-by giant El Salvador and Potrerillos Cu-Mo-Au deposits. Mirasol has systematically consolidated claims holdings at Rubi over the past 12 months and has expanded the claim area to a total of nearly 26,000 ha. Mirasol recently completed field evaluation and targeting programs at Rubi identifying three large-scale Cu-Mo- Au targets at the Lithocap, Zafiro, and Portezuelo prospects (Figure 1). The targets were defined by integrated analysis, including re-logging of drill holes and the re-interpretation of geophysics and geochemistry from previous Joint Venture (JV) partner exploration at Rubi. This was combined with recent Mirasol geological mapping, rock chip sampling and target vector modelling from field-based measurements of alteration minerology. 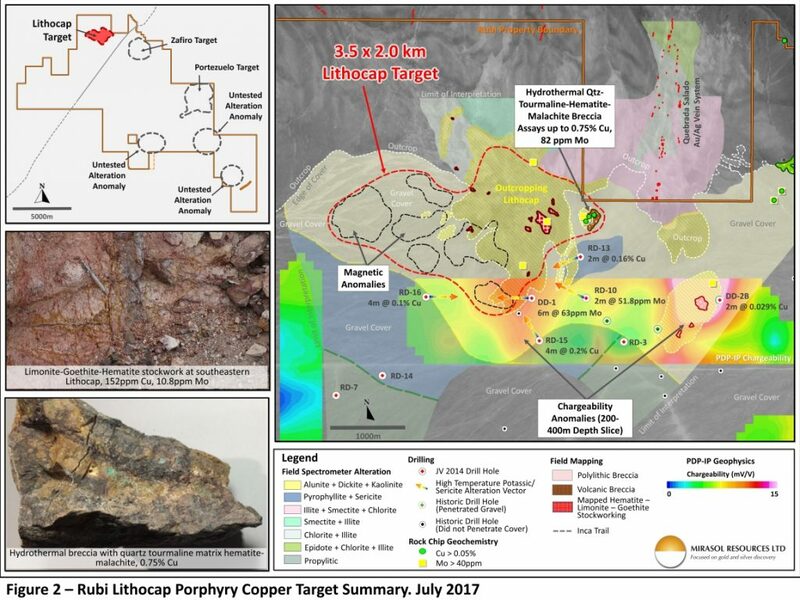 “The company has rapidly built a portfolio of quality copper targets at Rubi and at its recently announced Odin project located 35 km north of BHP’s Escondida Mine. 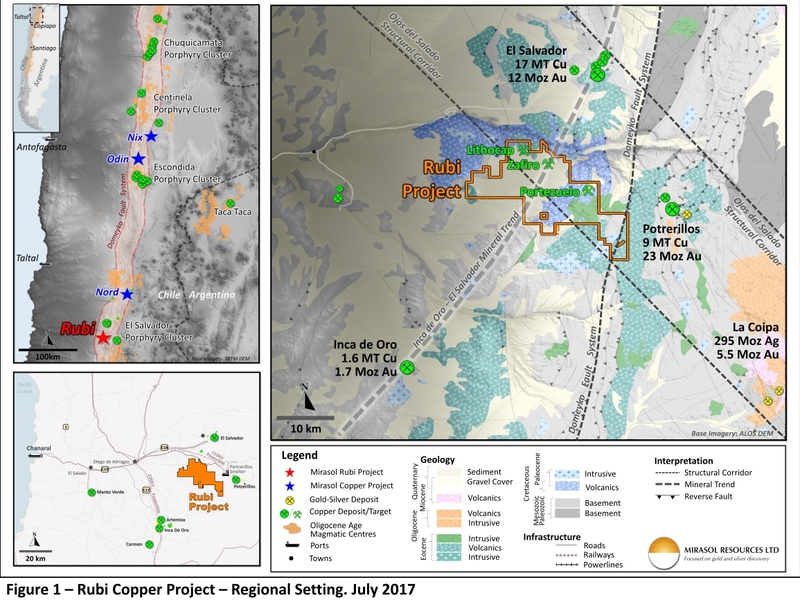 These and other recently staked copper projects strategically position Mirasol in the premier copper belt of northern Chile.” stated Stephen Nano the company’s CEO and President. The Rubi Lithocap (“Lithocap”) target (Figure 2) covers a 3.5 km by 2.0 km area centred on a large, deeply weathered, advanced argillic alteration zone, surrounded by thin gravel cover. Geochemically barren Lithocap alteration zones of the type seen at Rubi can form above or adjacent to large porphyry copper deposits. At Lithocap, previous explorers have drilled peripheral to, but not beneath or adjacent to the post-mineral gravel covered western edge of the anomaly. New Mirasol mapping and re-logging of previous drill holes has defined veining and brecciation with anomalous Cu and Mo mineralization and alteration patterns that vector toward potentially concealed porphyry mineralization to the north and north-west of the previous drill holes. The southern edge of Lithocap was “clipped” by a previous JV partner’s IP geophysical survey, which identified a large open-ended chargeability anomaly extending from 200 m to more than 400 m depth beneath the cap. This pattern suggests the presence of a deep weathering profile overlying a buried source of the chargeability anomaly, which may indicate the presence of sulphide(s) in the unoxidized basement rocks. This type of deep weathering in porphyry environments in northern Chile is often conducive for the development of supergene enriched Cu mineralization as at the nearby El Salvador mining district. The Zafiro prospect (Figure 3) features a 2.8 km by 2.2 km gravel covered area characterized by a subtle circular magnetic high surrounded by an incomplete, doughnut-shaped magnetic low. This magnetic signature may be indicative of a large gravel-covered intrusive with an alteration halo. The gravel cover in this area ranges from approximately 25 m to more than 200 m in thickness concealing the central target area. However, a large canyon 1 km to the north of the target cuts through the gravel profile exposing the basement rock. Mirasol’s stream sediment sampling of gullies that traverse this area have returned widespread strongly anomalous Cu up to 1,030 ppm (0.1%), suggesting either an “exotic” source of copper in the gravels and / or a primary porphyry source for the Cu in the gravel-covered basement of the Zafiro prospect. Reconnaissance mapping of the basement rocks in the area of the stream sediment anomalies has identified pervasive propylitic and advanced argillic alteration and zones of breccia and quartz-carbonate veins and stock-working that have returned strongly anomalous Cu-Mo-Pb-Zn (Au-Ag-Sb) rock chip assays. These types of alteration and mineralization may be found in the halo to porphyry copper deposits and suggest a vector to the south under gravel cover, which supports the concept for a concealed porphyry in the area of the Zafiro prospect. 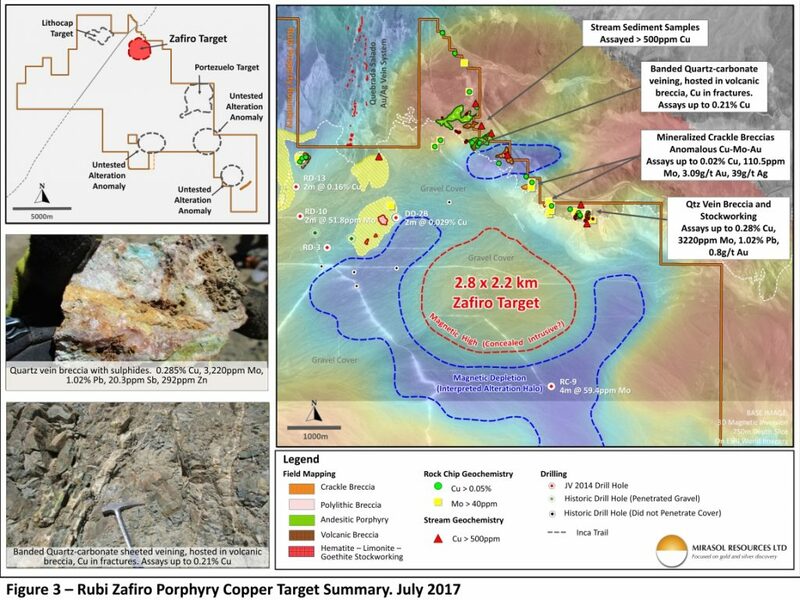 High grade “exotic” copper or a supergene enriched porphyry are both attractive exploration targets at the Zafiro prospect. Significant ore bodies of these types of mineralization occur at the nearby El Salvador mining district. At the Portezuelo prospect (Figure 4), the 4.5 km by 2.7 km target area is characterized by relatively thin gravel cover and intermittent outcropping. Analysis of Mirasol and previous JV partner data shows widespread anomalous Cu and Mo in soils, spatially associated with an oval-shaped magnetic feature that may represent a partially gravel-covered intrusive complex. Strongly oxidized, porphyry-like stock-works and sheeted veining with anomalous Mo and Cu, is locally exposed in road cuts and has been recently identified by Mirasol outcropping in creek beds in the north of the target area. A limited number of reverse circulation (RC) holes from prior operators were drilled into the southern part of the Portezuelo target prior to Mirasol staking these claims. The holes are estimated to have been drilled in the late 1980’s to early 90’s. The assays for these drill holes are not available to Mirasol, however sampling of residual RC chips on the drill pads returned anomalous Mo and Cu assays. Reconnaissance mapping and sampling to the southwest of the target has identified a multi-kilometre long zone of Au-Ag base metal veinlets that may represent a style of polymetallic mineralization commonly developed in the halo surrounding a porphyry centre. 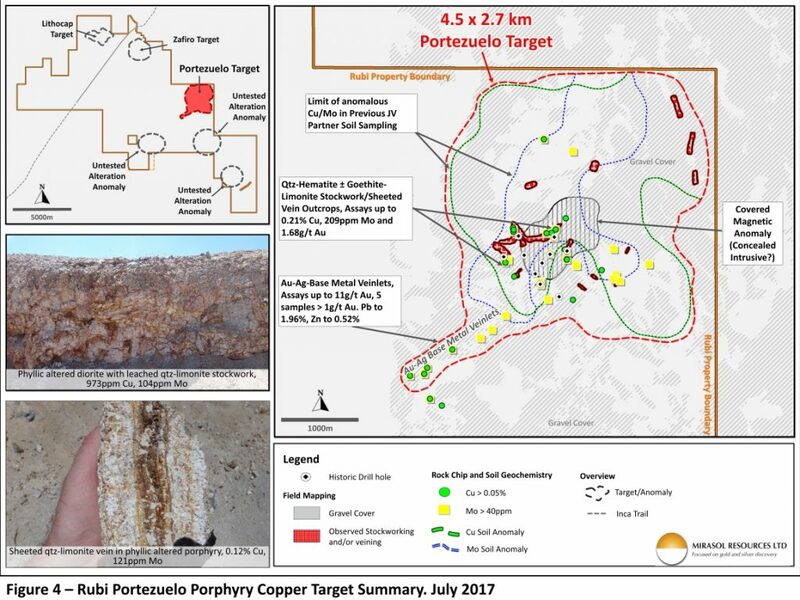 No systematic geological mapping, rock chip sampling or electrical geophysics has yet been undertaken at Portezuelo by the Company or its previous JV partners. Mirasol believes this large prospect warrants detailed exploration to define drill targets. Mr. Nano added: “Mirasol’s Rubi and Odin projects have received strong interest and we are actively seeking JV partners to drill test and develop these projects”. Remnants of the Inca Trail are recorded over a 30,000 sq km area of western South America. A strand of the trail network passes in proximity to the El Salvador mine and the Inca de Oro mine development near the Rubi Project. A 7.6 km segment of the trail, passes through the Rubi Project. Where preserved at Rubi the trail is seen as 2 to 3 m wide earth path. The exploration targets identified by Mirasol in this news release are separated from the Trail. Mirasol and its previous Joint Venture partner engaged independent Archaeological consultants to survey the Trail marking its location and to recommend preservation protocols to safeguard the Trail. In 2014 Mirasol’s joint venture partner drilled tested a series of targets at the Rubi project operating under the Chilean exploration drilling permitting call a “carta de pertinencia”. As part of the permitting process the archaeological report was presented to the Chilean environmental and cultural authorities who ratified the drill program and the procedures to preserve the Trail. All exploration on the project was supervised by Mirasol CEO Stephen C. Nano, who is the Qualified Person under NI 43-101. Mirasol applies industry standard exploration sampling methodologies and techniques. All geochemical rock and drill samples are collected under the supervision of the company’s geologists in accordance with industry practice. Geochemical assays are obtained and reported under a quality assurance and quality control (QA/QC) program. Samples are dispatched to an ISO 9001:2008 accredited laboratory in Chile for analysis. Assay results from surface rock, channel, trench, and drill core samples may be higher, lower or similar to results obtained from surface samples due to surficial oxidation and enrichment processes or due to natural geological grade variations in the primary mineralization. Forward Looking Statements: The information in this news release contains forward looking statements that are subject to a number of known and unknown risks, uncertainties and other factors that may cause actual results to differ materially from those anticipated in our forward-looking statements. Factors that could cause such differences include: changes in world commodity markets, equity markets, costs and supply of materials relevant to the mining industry, change in government and changes to regulations affecting the mining industry. Forward- looking statements in this release include statements regarding future exploration programs, operation plans, geological interpretations, mineral tenure issues and mineral recovery processes. Although we believe the expectations reflected in our forward-looking statements are reasonable, results may vary, and we cannot guarantee future results, levels of activity, performance or achievements. Mirasol disclaims any obligations to update or revise any forward-looking statements whether as a result of new information, future events or otherwise, except as may be required by applicable law.